How to choose a great pair of travel shoes? - Be On The Road | Live your Travel Dream! How to choose a great pair of travel shoes? These days travel accessories are all about fashion, comfort and utility. It is always a cat and a mouse game to find accessories that comply to all these three parameters. And more so with an important accessory like a good pair of shoes. Over many years of travel across multiple terrains and after learning from my many mistakes, I have put together some handy tips to help you choose those perfect pair of shoes for your next holiday or long trip. Wouldn’t it be nice to have a pair of shoes that you can wear for your dinner, take on your day hike, carry off on a visit to the museum and use it for walking around? Traditionally, people recommend substance or utility over fashion for a good pair of travel shoes. But, I think if planned well, you can carry off utility and fashion together. I would say that all shoes have to be fashionable else they don’t become a good pair of travel shoes. They can be made of leather, suede, nylon or any material. If they don’t look fashion friendly, they don’t deserve to be in my travel kit. If you are a frequent traveler, you will immediately empathize with me on this. Boots with steel toes that make the X-Ray machines go crazy or shoes with long laces that take ages to tie are a pain while clearing security at the airport. It is best to have shoes that have no metal in them and can be removed and worn easily. The loafers are a good example of airport-friendly shoes. These days with every country having a low cost airline and with them having weight restrictions, it makes sense to carry a lighter pack or suitcase. And that applies to your pair of shoes as well. In case you wish to change to your flip flops, you have to ensure that your baggage doesn’t become heavy and bulky because of your travel shoes. Lightweight shoes also feel great while walking long distances. Lot of tourists wear running shoes for holidays, but those pair of shoes wear out really fast when you go on short hikes or indulge in lot of street walking and especially if you carry a backpack. Hence, good soles are super critical for your travel shoes. They should have great grip (for rough terrain), great cushioning (for heavier loads or jumping around activities like an evening dance party) and they should be anti-skid (for those smooth airport and shopping mall floors and for wet surfaces). What is the point of having great shoes if you keep sweating in them? Air tight shoes lead to bad feet odour and bad sock odour, both of which are not preferable for closed hotel rooms and hostels. And even worse no one like sweaty feet while walking. Personally, I prefer my shoes to have a breathable membrane, which means that they keep my feet dry and they also dry out quickly in case they get wet. It is good to have solid cushioning for any kind of travel shoes as we travelers always end up walking more on our holidays. It is preferable to have high level of cushioning especially in the midsole. Good cushioning helps with bumps, prevents the feet from getting blisters and allows you to walk yourself a bit more without any discomfort. It would be nice for travel shoes to be waterproof, but fashion and waterproof usually do not go hand in hand. However, sometimes some shoes that meet all the above conditions come with a waterproof lining. For leather and suede, you get water-repelling spray that will keep your feet dry in rain, but not a downpour or in puddles. If your activity requires your shoe to be waterproof, then go for the waterproof option. I hope with these above tips, you can select yourself a good pair of travel shoes. Do remember that all of us travelers have different kind of travel needs and use our footwear differently. Hence, it would be best to weigh your options and preferences before shortlisting a new pair of shoes. Personally, I prefer shoes to sandals on my travels. I have a variety of boots in my shoe collection and I use it depending on the type of activity I would indulge in on my holiday. 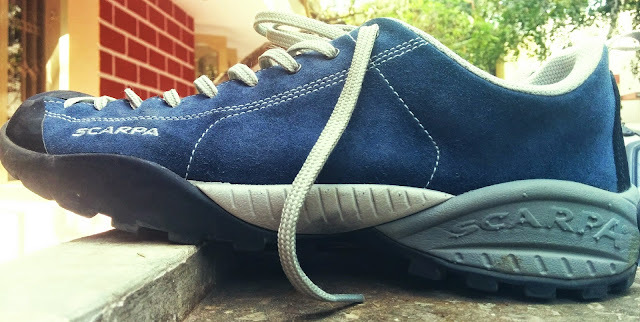 But, for a normal relaxed holiday with walking, exploring, parties, dinners and a easy to moderate hike, I prefer to carry my Scarpa Mojito Walking Shoes. Kathmandu: A City with an Old World Charm! Is Travel Blogging a Profession?